This is a great starter hook kit, composed of our most versatile hooks. Made from high grade steel, the solid 1/8 inch back plates work to disperse the workload throughout the wall. You can hang whatever you want! These hooks can handle any garage organization. 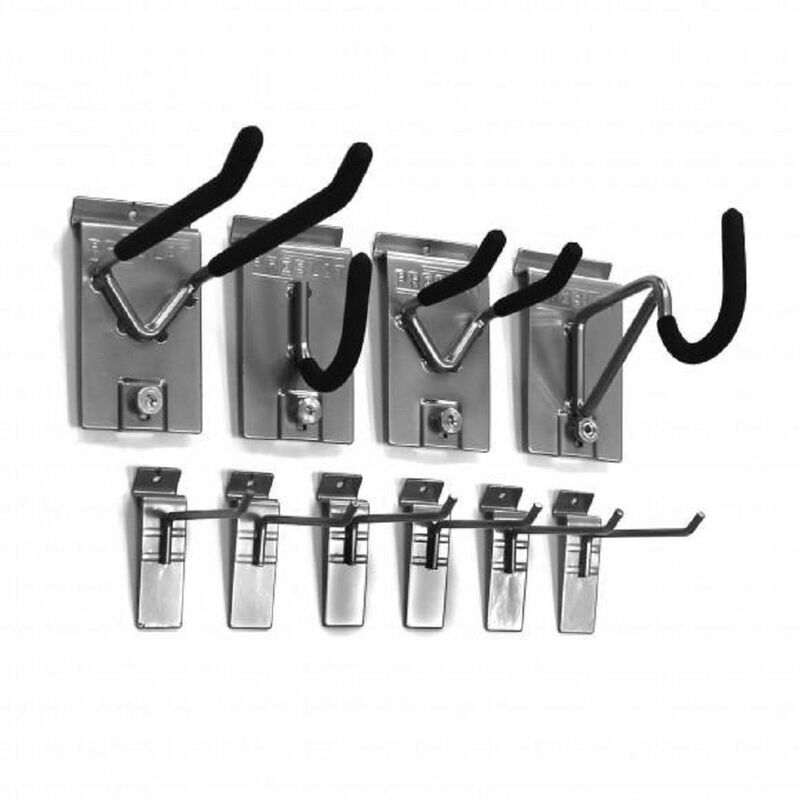 What's included: 6 x 4 inch hook (10002), 1 x 8 inch double hook (10010), 1 x 4 inch double hook (10011), 1 x Heavy Duty Hook (10012), 1 x U hook (10017). Husky 8 in. double hook is made from heavy duty welded steel. Ideal for storing power tools, saws, multiple shovels, trimmers and other bulky items. 8 in. double hooks are solid and fully locking to secure them in place. Made from steel with rubber cushioned tips to store your goods safely. Husky locking heavy duty J-hook is perfect for holding backpacks, hockey gear, golf bags and more to organize your garage. This rugged, heavy duty hook will help keep that pesky clutter up off the floor. Made of durable welded steel and powder coated finish. Rubber cushioned to store your items safely. Each hook can hold up to 50 lbs. The Proslat Ultimate Bundle includes 64 square feet of versatile slat wall storage and organization + 20-piece Hook Kit + Shelf & Basket Kit. This bundle consists of: 20 Proslat panels, covering 64 total square feet or a 16-foot x 8-foot section or , twelve 4-inch hooks, two 8-inch double hooks, two 4-inch double hooks, two super-duty hooks, two heavy-duty U hooks, two 12-inch x 24-inch wire shelves and three 15-inch x 12-inch wire baskets. Wall panels are eco-friendly, made from 90% recycled material, manufactured in Canada, hold up to 75 lbs. per square foot, easy to clean--wipe them clean or hose them down, are mould and water resistant and installation is easy! Shelves and baskets are made from high-grade steel and are silver powder-coated finish for increased resistance and baskets feature rounded corners. Wall panels have lifetime warranty, accessories have 10 year warranty. Proslat's locking heavy duty U-hook (package of 3) is perfect for holding backpacks, hockey gear, golf bags and more. This rugged 2.5-inch heavy duty hook will help keep that pesky clutter up off the floor. Made of durable welded steel and powder coated in Proslat Silver. Rubber cushioned to store your items safely. Each hook can hold up to 50 pounds. Wall Storage Solutions - Mini Hook Kit 10 Pieces This is a great starter hook kit, composed of our most versatile hooks. Made from high grade steel, the solid 1/8 inch back plates work to disperse the workload throughout the wall. You can hang whatever you want! These hooks can handle any garage organization.